The good news: our relatively strong economy helped to raise wages for everyone in 2016. The bad news: this is a mere blip in the context of overall inequality. And it’s likely to get worse. The Economic Policy Institute today released its annual report on the state of wages in America. Last year had some positive highlights: median wages grew by 3.1%, and workers in the lowest fifth of the wage distribution saw even stronger growth. EPI cites both low unemployment (attributable to the broader economy) and increases in minimum wage (attributable to political efforts) as the driving forces behind that rise in wages. In fact, the poorest workers in states that had minimum wage increases saw their wages rise twice as much as similar workers in states without minimum wage increases. This effect is even stronger for women, who are more likely to hold minimum wage jobs. 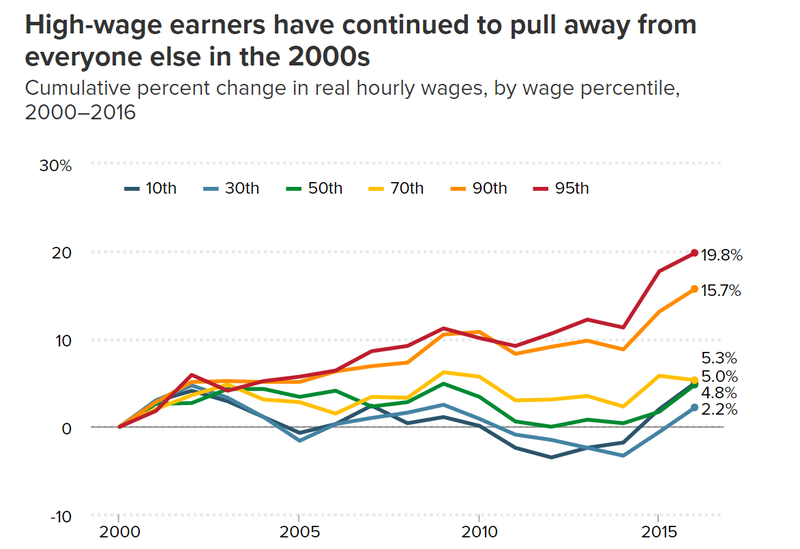 Since 2000, wage inequality has continued to get worse, because the strongest wage increases have gone to the highest earners. Since 2000, black workers have seen slower wage growth than white or Hispanic workers, and poorer black workers are not doing well at all: “[The] bottom 60 percent of black workers have seen their real wages decline since 2007, with the exception of those at the median.” The gap between black and white wages is now larger than it was in 2000. In essence, the last year of the Obama era was a modest battle victory in a long-term losing war against inequality. And when you gaze into the future, it is hard to imagine that the Trump era will bring as much good news. Trump and Congressional Republicans plan to pursue tax policies that will exacerbate, not ameliorate, inequality. They are also far more hostile to minimum wage increases. And while their deregulation plans could give corporate earnings a boost, they also make our economy riskier and more prone to another crisis, which would hurt the poor most of all. Nibble this tiny morsel of good news as long as you can. I do not expect it to last.